Indira Gandhi International Airport, DMRC (Delhi Metro Rail Corporation) and Reliance Infrastructure have recently started a seemingly time saving and convenient service from the heart of New Delhi for fliers who wish to board a flight from IGI’s Terminal 3 (T3). The service is called the Airport Express or the Gold Line. Since, we (me and my wife) had to fly to Pune from New Delhi last week and the flight was scheduled to take off from T3, we decided to give our routine ‘take-a-cab’ option a boot and try the Airport Express this time around. Although, it was not very convenient to first change two Metro lines to reach the New Delhi Metro station and then board the Airport Express, our earlier experience of the Airport Express in Hong Kong had been so pleasant that we could not help but think that it would be a similar experience here as well. However, our experience with the Airport Express was not as favorable as we would’ve wished it to be. For starters, we were almost denied entry into the Airport Express station as the security guys were of the opinion that we were late for checking-in and we would now have to leave the station and head straight to the Terminal 3 itself, if we really wished to fly. In reality, we were indeed late, but only by a mere 5 minutes and that too because there was no information anywhere that we need to report 2½ hours early if we really wish to use the baggage check-in service of the Airport Express. After much coaxing, the security allowed me to check with the information help-desk whether we could still use the Airport Express to check-in our baggage. It’s only when the lady at the counter nodded with her approval, we were allowed to get our baggage scanned and strapped for ‘Security Check OK’. After that we headed towards the ticket counter and was pleasantly surprised to find two touch screen kiosks adjacent to a manned ticket counter. Unfortunately, even though the TIMs (Ticket Issuing Machines) were new, their touch capability was almost as unresponsive as our PM – Manmohan Singh’s unresponsiveness to our nation’s issues. I kept on trying to touch the onscreen buttons but in vain. Since, time was running short and we were not sure what else we would have to encounter, we decided to utilize the manned ticket counter to buy the tickets for our journey. Once, we had the train tickets in hand, we proceeded towards the check-in counter of our Airline. The Airline staff was courteous, but it seems their system was not. The person checked-in our baggage in no time but as soon as he proceeded to print our Boarding Passes, his system got unresponsive. Even after 15-20 minutes of fiddling with the system including turning it off and turning it back on, the operator was unable to print our boarding passes. Frustrated of waiting, I jokingly recommended the operator to manually write our names on the boarding passes, to which he responded by frantically making calls to his seniors for assistance. After a further wait of 5 more minutes, the operator gave up and suggested that since our baggage was already checked-in, we can proceed to board the Airport Express and get our boarding passes printed from the check-in counters at the Terminal itself. Although, the suggestion was not entirely acceptable to us, we had no other choice than to abide by his suggestion. And hence, we proceeded to board the train. While going down the escalator we noticed that the train was at the platform and was about to close its doors, so we tried to run to catch it. But, it seems it was not our day and we couldn’t catch it before its doors closed on us. We waited 20 minutes (the trains have a frequency of 20 minutes) before we actually boarded the train. Our first impression was that it looks exactly like the one we travelled in Hong Kong, but as soon as we took our seats, we realized that though the chairs were ergonomically good they were made of out-and-out plastic with no sign of cushions for comfort. It is understandable that these trains are not designed for long distance travel, but this kind of ignorance towards travellers and their convenience is unacceptable. After approximately 18-20 minutes of travelling, during which the train stopped for 2-3 minutes at just one station – Shivaji Stadium and slowed down at the Dhaula Kuan and Aerocity stations, we finally reached the T3 station of the IGI Airport. As we got off the train and proceeded towards the station’s exit, to our horror, we realized that we had actually appeared outside of the Airport instead of appearing inside the premises !??. This was a huge shock for us. We had to make our way inside the airport after all the identity checks (once again) at the entrance of the terminal building. Once inside, we finally got our boarding passes printed and waited patiently to board our flight. The first train departs at 5 AM from New Delhi Station and at 4:50 AM from Dwarka Sec 21. The last train departs at 11 PM from New Delhi Station and at 10:50 PM from Dwarka Sec 21. 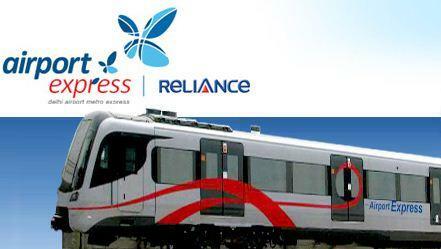 If you’re planning to use the Metro to reach one of the Airport Express’ stations, the easiest way at present is to reach the New Delhi DMRC station which has connectivity to both the DMRC and Airport Express Lines. Passengers need to report 2½ Hours at the station before their scheduled departure. The train frequency is 20 minutes. All in all, the Airport Express is a very good initiative but the execution seems (at least currently) like a feeble attempt which is far from the convenient and efficient service it promises to be. I sincerely hope the management takes heed and does the needful as soon as possible to make it a world class experience, something which it longs desperately. Thanks for the detailed information about Airport Express. I have also recently used Metro and found it good one. I understand your bitter experience but it saves the time. And what about Pune detail… uss ka alag se blog likh rahe ho kya?